Last week’s Facebook LIVE (Wednesday, December 26) was on the hot topic of Intermittent Fasting. Following the LIVE session, I was inundated with questions. Okay, “inundated” is probably an overstatement, but many people contacted me with the same questions about fasting. To help provide additional clarity, I curated your questions into a the frequently asked questions below. Fasting is the willing, deliberate, controlled abstinence of food intake. Intermittent fasting is the practice of cycling between periods of eating and not eating. You already participate in some type of daily fasting when you sleep. The word “breakfast” is the linguistic recognition that humans fast at night while they sleep. Intermittent fasting for health and weight loss typically requires increasing the non-eating hours and narrowing your daily eating window. Is fasting just starving myself? Fasting is not starvation. Starvation is the unintentional lack of essential nutrients necessary to meet your body’s metabolic needs over a sustained period. During starvation, the body will combat malnutrition by breaking down its own tissues. Starvation will result in systems failure and eventually death. In contrast, fasting people know where the food is but make a conscious choice to abstain for a variety of reasons. Fasting is the recognition that eating all-the-time is not healthy, and our biology works better when we balance periods of eating and non-eating. Fasting regimens vary substantially. While I can provide background and guidelines, your personal approach will depend on many factors. I recommend working with a life coach and doctor (you’re in luck, I’m both!) to develop and test a regimen based on your desired outcomes, health status and biology. Timeframes for fasting can be anywhere from hours to days. While most people engage in daily fasting routines, some find 24 to 72 hour fasts beneficial. There is one recorded fast that lasted 382 days, monitored by physicians in 1965. In this case study, the patient reported feeling well throughout the fast and doctors noted no electrolyte abnormalities. The patient went from 456 pounds to 180 pounds. Additionally, there is some research showing longer fasts, days to weeks, are beneficial for pre-diabetics and diabetics on metformin only. If you’re considering a longer fast, a discussion with a doctor to evaluate the risks and benefits is beneficial. For practical purposes, my answer will focus on daily fasting and alternating daily fasting, which are the two most common methods of fasting. Daily fasting is cycling between hours of eating and non-eating during a 24-hour period. With this approach, you limit eating to several hours or an “eating window.” Eating windows typically are anywhere from 4 to 10 hours in length. This means, during a 24-hour period, a person abstains from food for 14 hours to 20 hours respectively. The length of an eating window depends on your desired outcomes and individual results. Alternating daily fasting is simply not eating for a full 24-hour period every-other-day. With this approach, for example, you could eat dinner on Monday and not eat again until dinner on Tuesday. Remember, it is not recommended to have a free-for-all on food during eating windows. Some people will eat carbohydrates, processed foods and in general a poor diet during their eating windows, which I call “carb-age.”. I would advise against eating carb-age because junk food like Twinkies are not good fuel for your body. As always, I recommend eating high quality foods as your standard. Additionally, most people report increased food cravings associated with heavy carbohydrate diets. Yes. In basic, evolutionary terms, fasting was a necessity. If we were not equipped to handle food scarcity (fasting), our species would have never attained the status of Earth’s dominant species. During most of human existence, times of feasting were balanced by times of famine. When food was plentiful, humans ate when they got hungry. While some of the food we ate was used for immediate energy, our bodies converted some of the food to energy storage. At times when food was scarce, our bodies tapped into this energy storage. Winters, for example, were consistently times of food scarcity when our bodies had to tap into stored energy. We are made to consume in discrete periods of time, interspersed with periods when we do not eat. Yes. 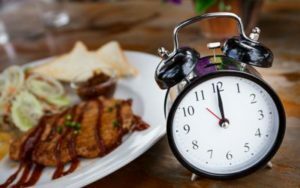 A growing body of research suggests that fasting, or specifically intermittent fasting, is effective for weight loss and managing common weight-related disease. Basically, our bodies are made to cycle between periods of eating and fasting. How does fasting cause you to lose weight? Fasting allows our insulin levels to drop. Insulin is a storage hormone and, in very simple terms, takes sugar out of blood (lowering blood sugar) and either utilizes or stores the energy. Insulin moves energy (in the form of glucose) into our muscle cells. When muscle cells are “full,” it moves the energy into the liver. Once the liver is full, insulin stores energy as fat. All food causes a rise in insulin levels. Fasting allows insulin levels to drop. If there is no insulin in our system, we are not storing energy. When our insulin levels drop very low, our bodies tap into the stored energy we have (fat) for fuel. Is fasting the same as calorie reduction? Americans have been “reducing calories” at the recommendation of their doctors and nutritionist as the primary way of losing weight and controlling weight-related diseases. The result has been increasing obesity and type II diabetes rates. Watch for a future Facebook LIVE on this topic (You have been warned!). Fasting is different from calorie-reduction diets. The calorie-reduction method does not produce the hormonal changes necessary for weight loss. When you spread eating – even low-calorie foods – out over an entire day, you are constantly releasing insulin. Consequently, your body never gets into the fat burning mode because your insulin levels never drop. Once again, this is an area of research and debate. Most people only consume plain water, black coffee and unsweetened tea during a fast. Some people, however, will drink bone broth or fat. Homemade bone broth has vitamins but doesn’t stimulate insulin production. Don’t buy the commercially available bone broth, which typically has food additives and will cause your fast to break. Some people will utilize fats during a fast helps with hunger. Fat has a very low insulin response. For example, bullet proof coffee is basically coffee with added fat. I typically stick to just plain water, coffee and unsweetened tea. No! Artificial sweeteners are the result of the calorie reduction approach to weight loss. Some artificial sweeteners were developed for people with diabetes as a sugar substitute. The truth is, artificial sweeteners still produce an insulin response and cause your fast to break. Just drink plain water! If I don’t eat, won’t my body burn muscle? This is a common misperception. The idea of utilizing muscle instead of stored fat for energy is not true and doesn’t make evolutionary sense. Our bodies look for efficiency. Burning lean body mass (muscle) instead of the energy stored is not efficient. The body will only burn lean body mass if there is no stored energy, such as in the case of starvation. Even human bodies with normal BMIs (18-25) have the equivalent of about 60 “meals” in various fat stores. Most Americans have BMIs above the normal range and typically don’t have to worry about burning muscle for fuel. Okay, I admit it, I added this question myself. Read my blogs, listen to my Podcasts (coming in 2019) and engage during my Facebook LIVE sessions. Obviously, I’m giving away all the education for free! That’s because this information is already available online and in books. Coaching is so much more than education! The reason people overeat, over-drink and generally make bad lifestyle choices has nothing to do with education or lack of information. Coaching addresses the underlying reasons you engage in self-destructive behaviors by addressing your thoughts, motivations and fixed false beliefs. Like any great athlete or team, people often need a coach. Coaches push you to be your best by providing constructive feedback, encouragement and challenging fixed beliefs that keep you from attaining your goals. While ultimately, you are accountable for your own actions, a life coach helps you achieve your potential by asking the hard questions and digging into your thoughts, which produce feelings, actions and inevitably your results. Read my blog post, “The Good, The Bad and the Life Coach” for more information. You can also contact me for a free mini-coaching session.